Gary D. “Zip” Hanson, 70, of Fort Dodge, passed away peacefully Tuesday, August 21, 2018, at the Paula J. Baber Hos­pice Home. Funeral services will be 10:30 a.m. Saturday, August 25, 2018, at St. Olaf Lutheran Church with Rev. Len Halvorson officiating. Burial will be in North Lawn Cemetery. 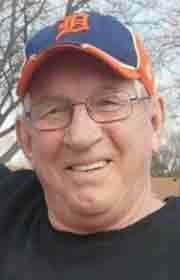 A visitation will be 4:00 to 7:00 p.m. Friday at Laufersweiler-Sievers Funeral Home. Gary is survived by his sons, Chad Hanson and his wife, Amy of Maple Grove, MN and Nick Hanson of Fort Dodge; grandchildren, Alexis Hanson, Seth Hanson, Dylan Hanson, and Ryan Hanson; and sister, Sue Green of Fort Dodge. He was preceded in death by his parents, Gail and Clara (Orness) Hanson and niece, Crystal Green. Gary Douglas Hanson was born October 27, 1947 in Fort Dodge. He was raised and educated in Fort Dodge. He continued his education at ICCC and Iowa State University. In 1968, he joined the Marine Corps and was honorably discharged in 1972. He was united in marriage to Carol Dishman on March 15, 1975 in Fort Dodge. The couple made their home in Fort Dodge and later divorced. Gary worked for the United States Postal Service for 18 years before retiring in 2005. He was a member of St. Olaf Lutheran Church, the Iowa Softball Fast Pitch Hall of Fame, and the Fort Dodge Softball Hall of Fame.